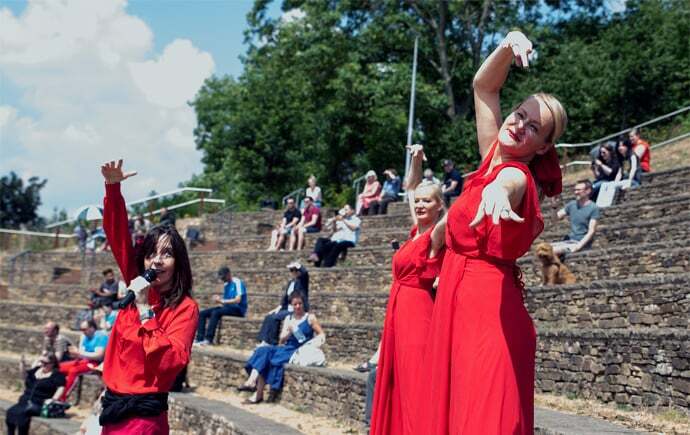 Hundreds of Kate Bush fans descended onto Sheffield’s South Street Amphitheatre over the weekend to mark the 40th anniversary of ‘Wuthering Heights’ with a mass re-enactment of the song’s video. It was part of a worldwide celebration called The Most Wuthering Heights Day Ever 2018, with events taking place in Melbourne, San Francisco, Sydney, Gothenburg, and Dublin. Fans were encouraged to dress in red and perform the famous dance from the music video. The event coincided with Emily Bronte’s 200th birthday – the author of the book of the same name which inspired an 18 year old Kate Bush to write the song, eventually going on to claim the first number one written and performed by a female artist. It was also Kate Bush’s 60th birthday.